From Berlioz to the Bee Gees: This is the guiding theme of the 2019 edition of Festival Classica. Set in Montérégie, specifically Saint-Lambert, it welcomed 65,000 festival-goers last year and hopes to reach similar heights with its ninth edition. “The idea to put together a festival came to me in 2008, while I was an invited soloist for the 25th anniversary of Versailles’s Centre de musique baroque,” recounts general and artistic director Marc Boucher. “In Versailles, there are several concert halls: the Trianon, the Opéra, the Queen’s Theatre, the Royal Chapel, etc. I saw people walk out of one concert, take a little stroll in the gardens, and then head over to another concert. That planted the seed for a festival in Saint-Lambert, since its historic downtown area, with five churches within walking distance of each other, would allow for it. The biggest outdoor concert takes place on June 1, the Saturday night of the festival’s main weekend. A symphonic tribute to the Bee Gees, Saturday Night Fever brings together the Orchestre du conservatoire de la Montérégie; a chorus made up of several choirs, including that of the Opéra-bouffe du Québec; a rock group; and guest vocalist Élizabeth Blouin-Brathwaite. The show offers a symphonic interpretation of the greatest hits of the 1980s. The indoor programme, diversely featuring everything from baroque music to jazz, offers chamber music concerts with established and emerging artists. The variety in the festival’s musical offerings reflects the eclectic tastes of its artistic director: “I listen to all kinds of music, from 1980s progressive rock to jazz and hip-hop, not to forget classical music, of course,” explains Boucher. This year’s program will pay tribute to Berlioz, Roussel and Offenbach, who all have anniversaries this year. There will also be conferences held their honour. The big outdoor concert on May 31, Operette en folie, is dedicated to Jacques Offenbach and will reprise some of the greatest pieces in his repertoire. 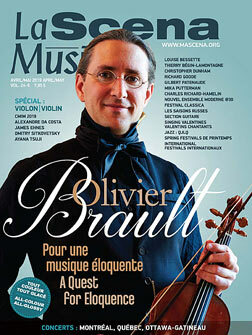 A true passion for Boucher, who is himself an accomplished vocalist, the French mélodie is featured in the third edition of its Récital-concours international de melodies françaises. Ten singers will be selected for the semifinals taking place on June 14. Five will then be chosen to interpret a song cycle of their choice at the finals on June 16. “There are not many competitions devoted to French mélodie and since it is one of my greatest passions I took it upon myself to put one in place, with grants that are increasing every year,” explains Boucher. Again this year, 50% of the final mark will be decided by the public, so artists know the importance of giving a quality performance. The festival will awaken all of the senses thanks to Notes gourmandes, a food fair taking place near the concert halls. “It is important to us that local artisans can make their products known,” emphasizes Boucher. The Cirque Éloize will create a festive atmosphere with their presentations on the five outdoor stages. Circus artists will offer performances all day long in the company of a musician, following an established schedule. An improv poetry event will also be held on the Aberdeen Street stage: three poets will improvise poems and invite the audience to sing them. The interactive and quirky event will delight attendees of all ages. The program includes children’s concerts as well, notably Sorcière Malbouffa, a show by soprano Nathalie Choquette. This indoor concert takes place on June 1. For yoga enthusiasts, there will be a session accompanied by Gregorian chant. “We found that the spirit of yoga agreed nicely with that style,” Boucher explains.